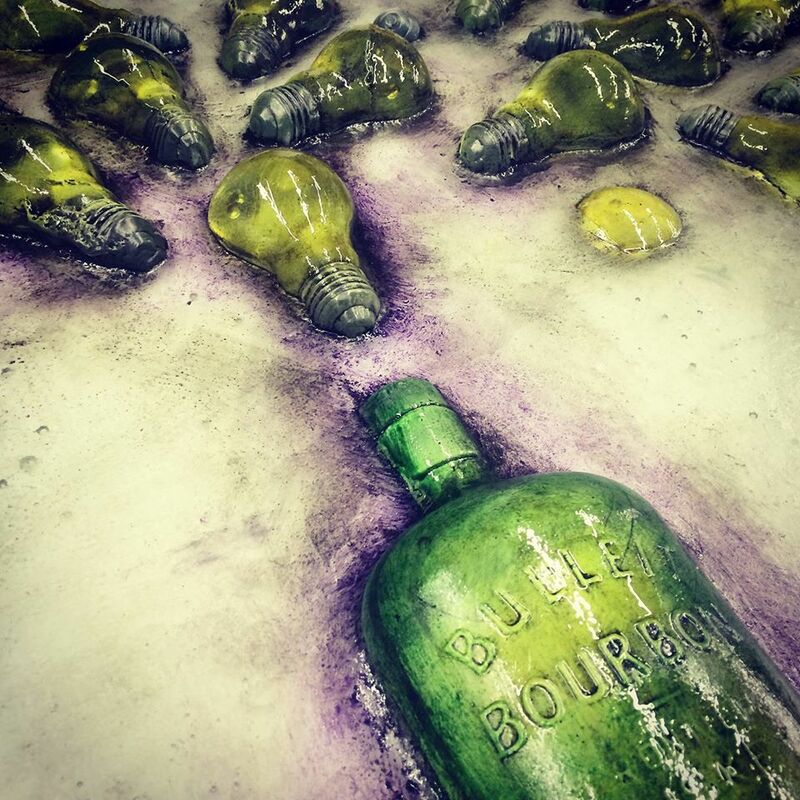 Nikki O’Neill has been working with glass for more than 25 years, and currently uses kiln-forming techniques to create sculpture and vessels from recycled glass. Nikki has a great show at Waverly Street Gallery open thru August 1st. Gallery Hours: Tuesday – Saturday 12-6 P.M.
Two exciting evolutionary themes inspire Nikki O’Neill’s visual diaries in kiln formed glass: the watery, primordial origins of life, and the delightfully intricate and richly colored primitive creatures that live there. 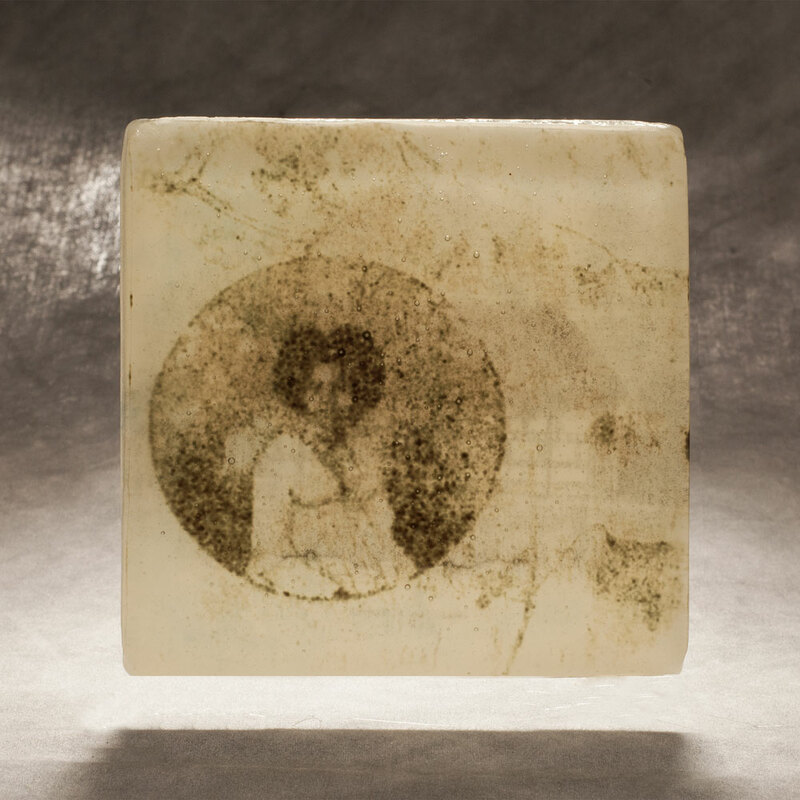 Glass is the perfect medium to explore these mysteries, often revealing exciting visual discoveries as she manipulates heat, gravity, gasses, and time to melt and combines glass with natural raw mineral compounds, metals, salts, and oxides. These basic elements are also those of life’s origins, and perhaps provide a glimpse into our own organic beginnings. After initial ideas are developed, glass is cut, heated, shaped, and cold-worked. She is often delighted to discover visages of primordial beginnings and early life emerging from the bubbling cauldrons of inhospitable environments. It is art and science; exploration and discovery; glass and nature that fuels her heart and imagination each day. Along with formal studies in the studio arts, Nikki O’Neill earned a PhD degree and worked as a research scientist and educator in the biological sciences for 30 years. 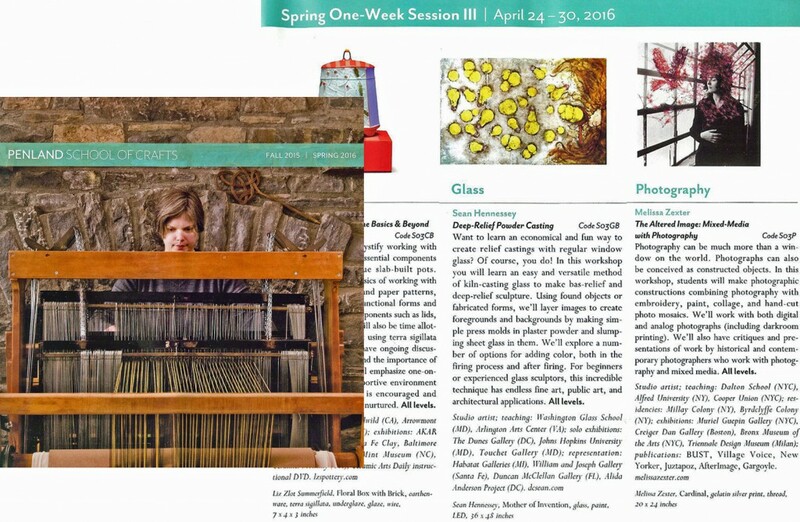 She has exhibited her art extensively in the Mid-Atlantic region in juried shows, receiving honors including “Best in Show” by the Creative Crafts Council in 2013. 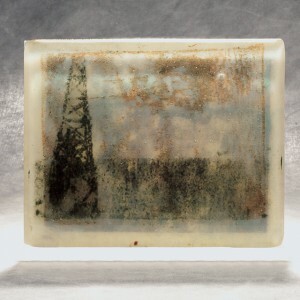 She regularly teaches workshops in kiln formed glass. 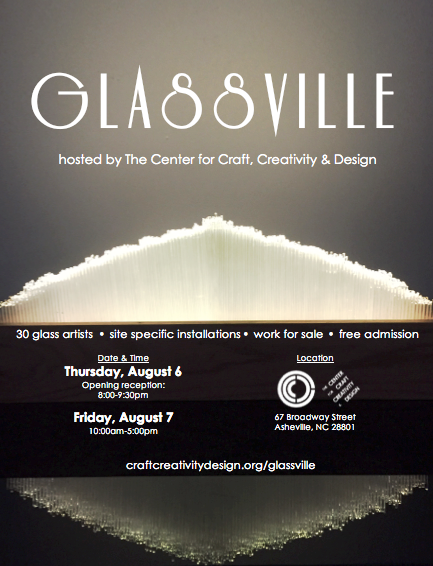 Asheville, North Carolina’s Center for Craft, Creativity & Design has an incredible showcase of area glass artists – titled Glassville in Asheville! If you are in Asheville, in early August…..you should check out this amazing small show. 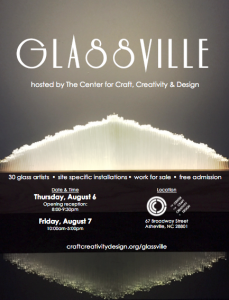 Featuring work from both emerging and established glass artists from Western North Carolina and the surrounding region, Glassville will offer an excellent opportunity for the public to meet and interact with the artists and their work. 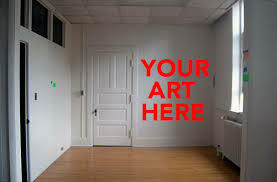 Artists will be present for the duration of the event and work will available for purchase. 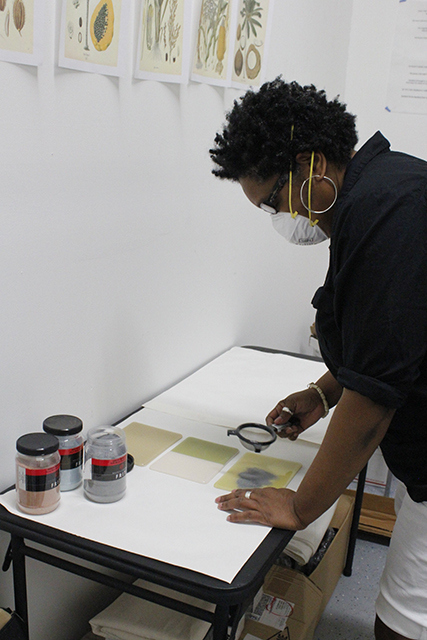 Many artists will be presenting experimental bodies of work, exhibiting pieces they have not shown anywhere else, or using the space to create installations specific to the site. 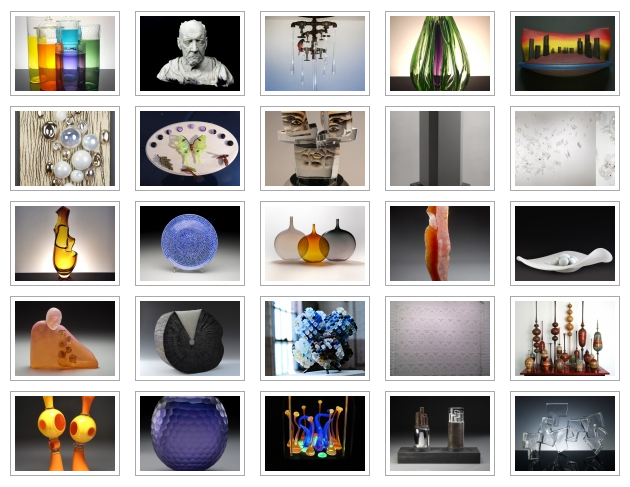 The event offers the unique chance to view work that explores the future of glass while also recognizing the rich history of the medium in the region. 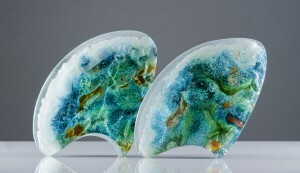 Sculptor Syl Mathis has been casting at the Glass School, creating new works. 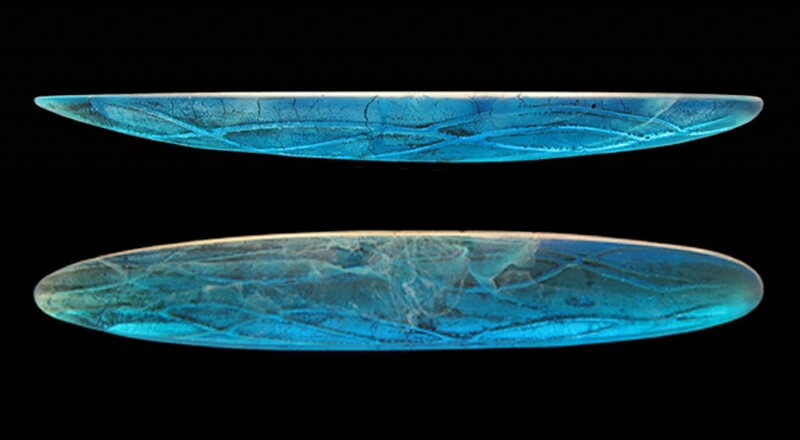 He checks in with a photo of his latest artwork divested from the plaster: ”Cloud Boat” – 8.5″ x 1.25″x 0.8″ (glass without base) – cast and cold-worked copper blue Gaffer glass. 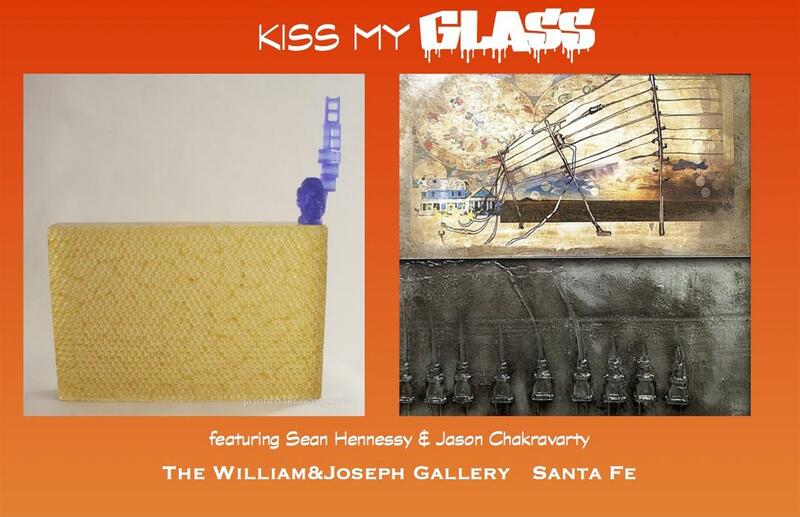 Santa Fe, New Mexico’s William & Joseph Gallery presents “Kiss My GLASS” an exhibition featuring the glass artwork of OSAP‘s Sean Hennessey and Arizona-based sculptor Jason Chakravarty July 1-31, 2015. 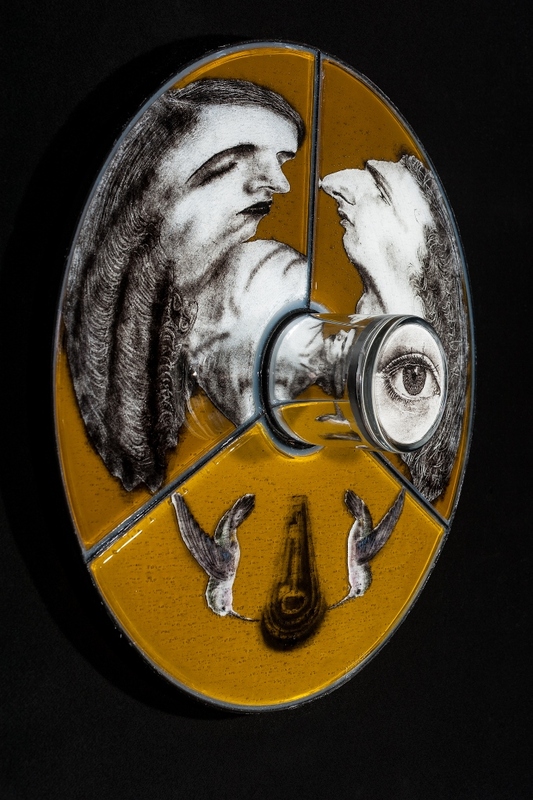 “Kiss My Glass” aims to showcase the innovative and intriguing glass sculpture created by these two narrative artists. Far away from the traditional blown glass vases, these two artists have created a body of work that makes one laugh, think and asks us to see glass in a new light – as a vehicle for narrative story telling in a three dimensional format. 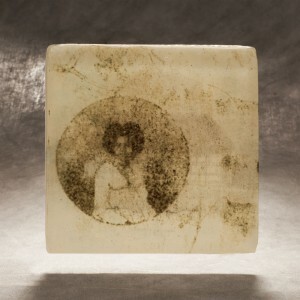 Jason Chakravarty is a mixed media, object maker living in Arizona. 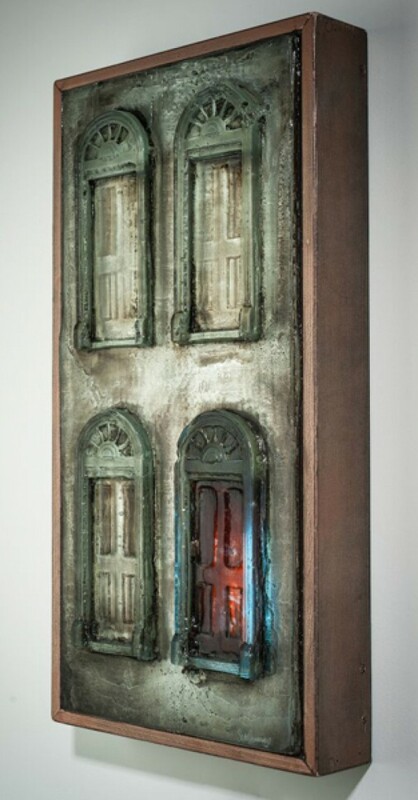 The majority of his work is cast glass and often incorporates neon for illumination. 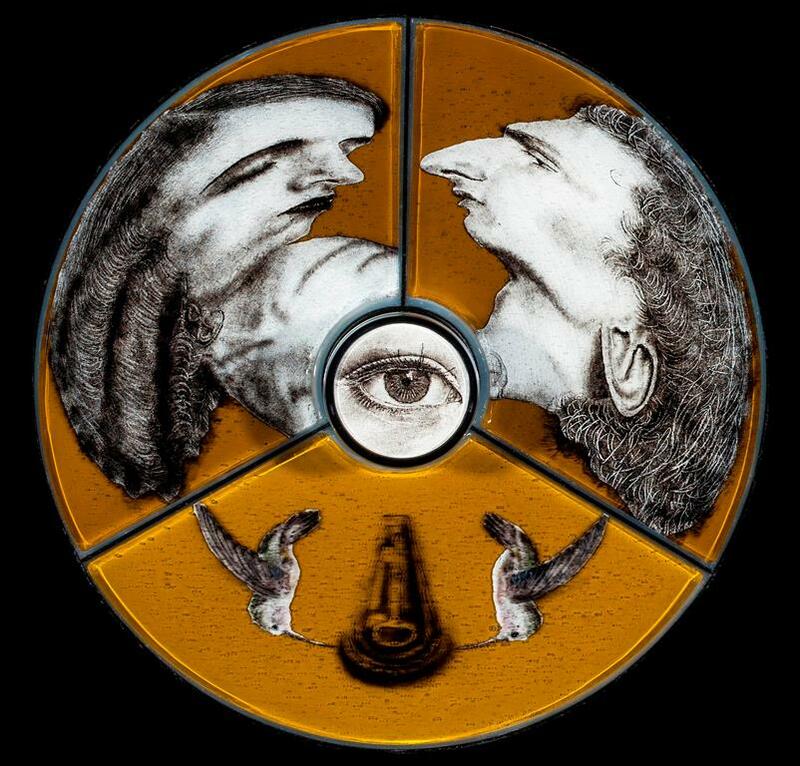 His most recent works are semi-auto biographical and reflect on human relationships, communication, and social networking. 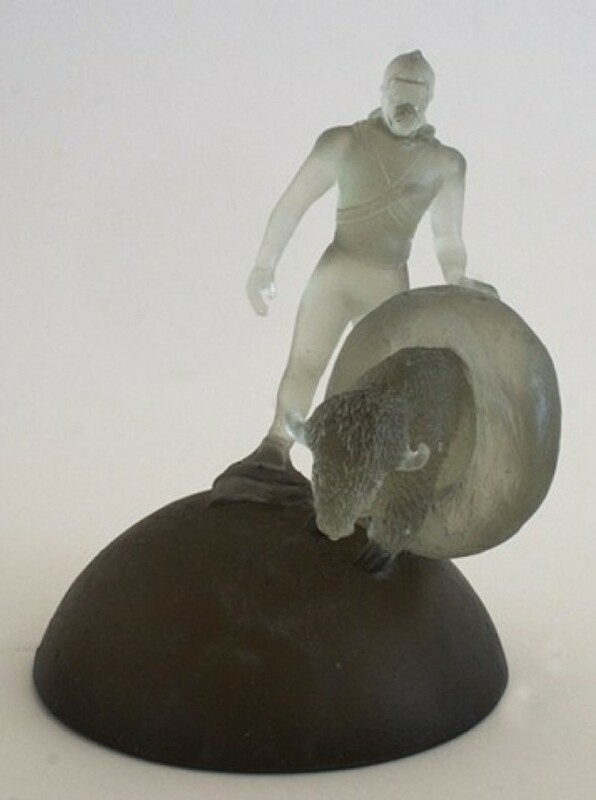 He holds an MFA in Sculpture from Cal State University and a BFA from Arizona State University; he has also studied at Pilchuk Glass School, Pittsburgh Glass Center and and an Artist in Residency at Toledo Museum of Art and Alfred University. Sean’s combines cast glass, concrete, photography, drawing, light, vdeo, found objects and steel in his works. He holds a BA in Sculpture and a Minor in Philosophy from Berea College and also studied at the Institute for International Studies in Florence, Italy. 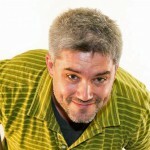 He has also exhibited at SOFA Chicago, John Hopkins University and was a featured artist at the National Institute of Health Gallery, as well as many select group exhibitions. The Washington Glass School wishes a Safe and Happy 4th of July to all! !